There are many men who would like to meet Russian girls online but different rumors about Russian dating scam prevent them from finally creating their profiles on one of the dating sites. You shouldn’t be so apprehensive since scammers usually operate using the same schemes which can be easily detected with the naked eye. All you need to do is to be cautious and attentive. So, how do all those tricksters work? They register with dating sites under fake names and start looking for their victims. A scammer can be either man or woman who uploads photos of other beautiful women, usually pictures of models downloaded somewhere from the Web. All scammers pursue one and the same goal – swindling you out of your money. So if a woman requests money from you, obviously you’re dealing with a scammer. This is the most apparent sign and it can take a while before she’ll directly ask for financial help. Until then, you may not notice other red flags and fall for a woman making plans for your future. If you don’t want to waste your time with a fake, here are those minor signs indicating dishonest intentions of your online interlocutor. Paying attention to them you’ll be able to detect online dating scam. It’s possible to figure out a scammer by looking at her profile. If it’s incomplete or there is little information, it’s most likely that woman is not interested in finding a man for a serious relationship because those women who really do fill in all the fields in order to give the men a clear idea of their intentions and preferences. So, this is the first red flag that should alert you. Decent Russian women usually don’t write to men first. They wait until a man makes the first move. If a woman initiates a chat with you, it doesn’t necessarily mean that she is a scammer. But if she bombards you with questions and openly ignores yours, and those questions are aimed mainly at revealing the information about your financial status, be watchful. One of the most popular online dating scams in Russia lies in sending identical messages to hundreds of men and waiting until a victim swallows the bait. If you feel that woman’s messages are impersonal and as if generated for a wide audience, your guts may tell you the truth. In order to make you send them your money, scammers will invent a touching story that will evoke sympathy in you. It can be a story about a sick relative who needs money for surgery or she will tell you how hard life in a small Russian town is and how she struggles to make ends meet. A decent real Russian woman will never tell a stranger about her personal problems, so view those “sad” stories as an attempt to mislead you and appeal to your sympathy. How many women have declared their love to you after a first date? None? And what about a woman who says that you’re the one already in the second letter. A real Russian lady will hide her feelings until she hears those famous three words from her man. That’s why if you receive a letter in which your new online acquaintance writes the words of flattery and love, she is a fake, not a real Russian woman. 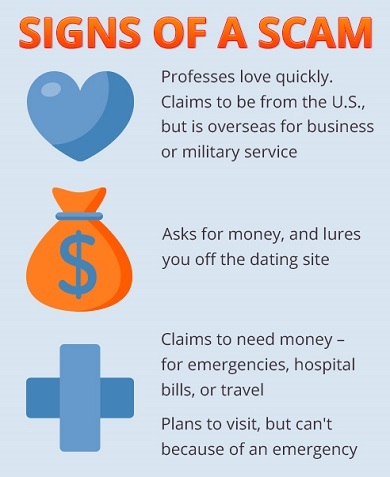 A surefire way to detect a scammer is to offer your date to meet in person or to get in touch via video chat. Since a scammer doesn’t want to be unmasked, she will refuse. However, some may agree but when the time for a date comes, they will write to you saying they are too busy and can’t make it. They will keep agreeing and finding excuses as long as you keep in touch. So once her conduct gets too suspicious stop writing to her and report her to admin. Another scheme often used by Russian scammers is connected with plane tickets and visa expenses. Usually, it looks like this. You communicate with a woman, get to know each other, and when you think that your online dating is going somewhere, she expresses her wish to move to your country or come to visit you. She even may offer to send you a copy of her pass and visa to sound more convincing and then ask you to send her some money because she is broke and can’t afford a plane ticket. Or she may not ask for money until the last moment when she will suddenly ask you to send her a particular sum in order to cover some fictional immigration costs. Remember that once you send your money, you’ll never hear from her again. If you deal with a real Russian woman, she’ll invite you to her country rather than offer to come to yours.